Jasper and Una came to us from a shelter. Jasper had been brought in after he was discovered during winter, living on the outskirts and eating food that had been left out for hedgehogs. During initial assessment he was aggressive and anti-social toward both humans and other cats - apart from Una - so they were listed as a pair. Jasper continued to lash out at humans while in the shelter. When my wife and I visited, looking to adopt a pair of cats, Jasper was about a week away from being declared effectively feral and taken off the adoption list. When we were let into the enclosure, he attempted to bite and claw me. Nevertheless, we decided to attempt adopting as we wanted a pair who got on with each other. 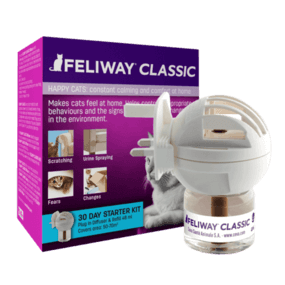 To ease their transition, we put a FELIWAY diffuser in the flat before they arrived. For the first few weeks, Jasper and Una both spent a lot of time hiding or hissed and snapped when we got near them. 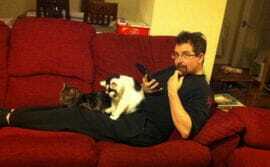 However, within a month, they were both curling up on our laps.